I have been working to get different kinds of hardware monitoring working in a consistent manner. This is the SuperMicro SuperoDoctor sensors package. There are some caveats here. Obviously, you must have the Superodoctor SNMP extensions installed and working. I have tested this with SuperoDoctor III running on Windows Server 2003 (using native SNMP extensions) and SuperoDoctor II on Linux (using net-snmp extensions) and both seem to work fine. Last edited by ehall on Thu Nov 11, 2010 9:27 pm, edited 13 times in total. Which SuperMicro model is this template for? From my experience (with MRTG and supermicro superodoctors) OID-s vary from model to model (as some have 10 fans, other 2, etc). I saw it reads and determinates available monitoring items - very nice! THanks for these great scripts, I have a little problem though. I copied the XML from Script_queries to the script_queries folder, the scripts to the scripts folder, and i imported the templates into Cacti, but one of the templates (cacti_graph_template_sensors_supermicro_fan_sensors_8x.xml) gave me some errors: Unmet Dependencies (See Pic). I assume that it is because of this that my fan and termal sensor graphs are not working. Cacti does not seem to export GPRINT definitions, so you will need to manually create the missing GPRINT preset. Click on the Graph Management cacti menu item, and then click on the (new) GPRINT Presets sub-menu underneath. Create a GPRINT Preset with the exact name of "Exact Numbers" and the GPRINT Text value of "%8.0lf". That should allow the graph templates to be imported successfully. hmmm, that GPRINT Preset was already there. Any other thoughts? In looking at what happens on the import, the GPRINT shows good, but the unmet dependencies appear to be on Data Template Items. Am i doing this right? I just import the 7 XML templates, correct? The tarball contains cacti_data_template_* files so it should be working. Did you import those before you imported the graph templates? I don't have any ideas beyond that--there doesn't appear to be any hard dependencies in the graph templates so it should be working. hmmm, yeah, imported all the data templates before the graph templates. Maybe i will just go through all the steps again. I noticed the tarball did not have the default 1X graph templates so I rebuilt the tarball. This shouldn't have been the cause of your problem but who knows. I am having the same problem as apperrault from above post with the screenshot when importing. I tried both cacti 0.8.6i and 0.8.6j versions - no difference. 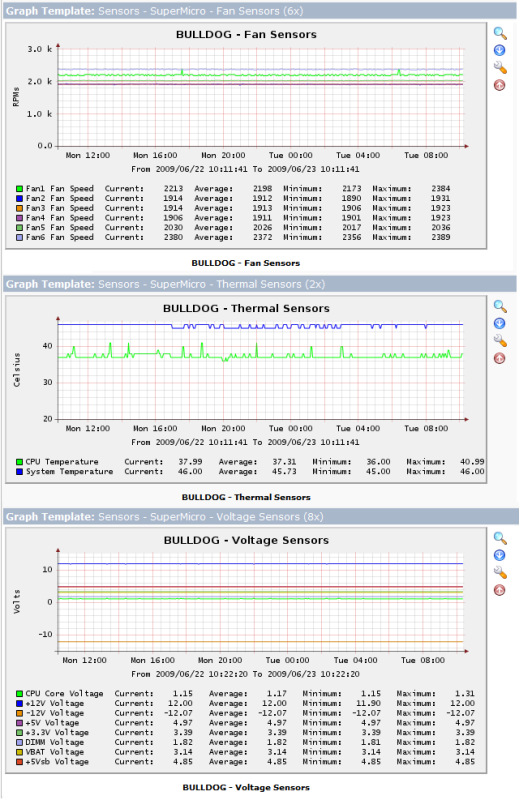 uppon 'devices' I select the desired host, then at "associated graph templates" I add the supermicro (8x) templates (fan/voltage/thermal), then "create graphs for this host" highlight the new "sensors - supermicro ..." graph templates, click create button at the bottom. However I always get broken image for that graph. Any help will me much appreciated! I uploaded a new version that should work with both Cacti 0.8.6 and 0.8.7 and should also support the SNMPv3 stuff in 0.8.7.
have you got it working with windows ? I had it working with superodoctor III on Windows to make sure the OIDs were the same, but I haven't tried again in the past couple of years. I'd email Supermicro support about the conflict you are having, they have always been nice to me.